Barrel Stave Tasting Table (WV105). A wine barrel repurposed into an uncommonly beautiful tabl..
Barrel Table and 2 Barrel Stave Stools- Made from a real wine or whiskey barrel this set will be the..
Barrel Top Side Table (P/N Model 158). 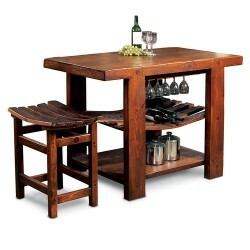 Wine barrels are made from century-old, hand-split oak ..
Wine Barrel Stave Table and 2 Stools (P/N WBTT10+2WBTS10). The stools are made entirely from b..